Welcome to the Web edition of Chez nous! Here you’ll find all the articles from the current printed edition of Chez nous as well many news items, events and other information found only on the online edition. 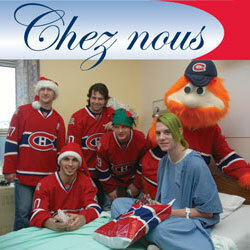 Featured: MCH patient Martin Sweeney gets a surprise visit from Canadiens players (kneeling, l to r) Maxim Lapierre and Andrei Markov, and (standing, l to r) Alex Kovalev, Robert Lang and team mascot Youppi. The Medical Records department at the MCH has just produced a pamphlet to answer parents’ questions about accessing their child’s medical records. This bilingual document addresses the most frequently asked questions from patients and their families. View the pamphlet in PDF format. When a child becomes ill, it is devastating. All aspects of family life are affected. In addition to coping with their child’s sickness, some families face a financial burden as well. Families who live in outlying areas must suddenly bear the costs of travel to the hospital and finding a nearby place to stay. Those with limited means may not be able to pay for the medications their child needs. Often parents need to take time off work or even leave their job to care for their child. The MCH’s Tiny Tim Fund was created to provide much needed relief to families struggling financially as a result of their child’s sickness. Travel, food, lodging and medication are some of the expenses that may be covered to help a needy family as it copes with the challenges of caring for a sick child. This year, as the holidays approach, the needs are greater than ever. If you would like to help the Tiny Tim Fund provide assistance to a struggling family, please send your gift by mail or by internet to the MCH Foundation. Thank you for making the holidays happier for those less fortunate. The holidays are bound to take a toll on your physique! So make it your new year’s resolution to get into shape! Contact Karen by e-mail or by phone at 514 489-7717 by January 9. Dr. Harley Eisman, Director, Medical Emergency at the MCH, gave a number of interviews in mid-November about the high volume of patients coming to the ER. Dr. Eisman was interviewed by the following outlets: The Gazette, Le Journal de Montréal, La Presse, CBC Radio Homerun, CJAD News, CBC TV, and Global TV. A few days before the Grey Cup final on November 23, a number of players from the Canadian Football League (CFL) visited the MCH. Television stations TVA, Radio-Canada TV, CBC TV, and CTV, as well as newspapers La Presse, Le Journal de Monréal, and The Gazette all covered the event. MCH oncology patient, 13-year-old Marc Normandeau, who has raised almost $20,000 for the MCH Foundation, is the subject of a feature article in The Gazette. Join Melanie Richards - certified yoga teacher and owner of HappyTree Yoga Studio - as she helps you discover new ways to manage stress and increase productivity at work. Concrete tips and exercises will be shared on how to alleviate back, neck, wrist and shoulder strain, as well as improve breathing and increase energy levels. Upon signing up at HappyTree, you’ll receive a complimentary consultation and carefully selected yoga class to benefit your needs. The MCH media portal is online!